My diary entry for 24th June 1973 is not exactly revealing. As it was raining steadily in the Lake District, I was given a second day off. ‘We had a quirte morning,’ I wrote. I am sure I needed one. After a heavy week’s filming I’d spent the official ‘Unit Day Off’ writing five end-of-year exam papers, answering correspondence from school friends and going to Kit Seymour’s thirteenth Birthday party. I must have been exhausted. Legally I was meant to have two days off a week. This was the first time it had been possible. Suzanna Hamilton’s diary adds little more, but my mother was on set, as was a journalist from The Guardian, so I can tell you what happened. I can even tell you what the location caterers from Pinewood cooked that day: Melon, followed by roast beef with Yorkshire pudding, boiled or roast potatoes, peas and carrots with apple crumble or tinned peaches served with custard or evaporated milk. It was a Sunday. Suzanna noted that we had ‘salad for super’, her favorite food. “The houseboat has been converted from a pleasure steamer,” wrote Michael McNay in the Features section of The Guardian, “the whole of the superstructure fore faked up by props, the cabin aft converted into a retired colonist’s sittingroom – African rug, flowery curtains, assegais on the walls, an ebony elephant with silver howdah and trappings, a walnut wireless cabinet, tall brass oil lamps, a pile of 78rpm records, a silver mounted cricket ball (presented to G.Gumbleton, 1899, for the highest individual score of the season), a chest, a writing desk and an ancient upright Imperial.” I have typed this up exactly as it was published on 7th July 1973. By props, I don’t think Michael McNay meant pit-props. He was talking about the work of the design team headed by Simon Holland. 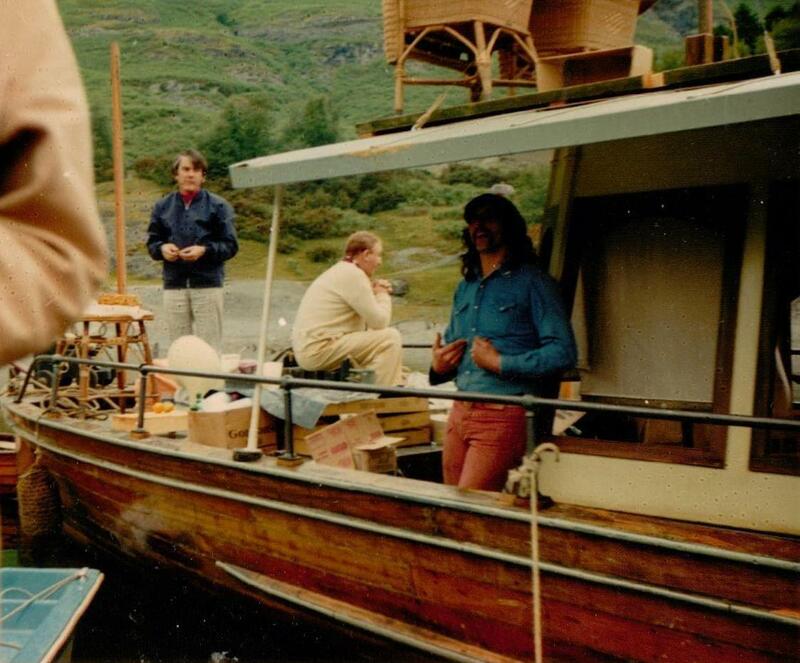 Ian Whittaker, who later won an Oscar for set dressing, helped Simon to create Captain Flint’s cabin with one of the Prop men who is photographed here. Does anyone know his name? I think it might be Terry Wells. I expect the cane chairs and side table were being temporally stored on the roof when this snap shot was taken so as to make space for camera and lights. The gaffer and camera crew would have been in the process of setting up inside the cabin. Sound would not have settled in yet. How do I know that after all these years? I can see the recordist’s arm at the left of the photograph. I still remember his coat. “Ronald Fraser, alias Uncle Jim, is tapping away at a book.” Michael continues. “Last minute panic: who can type out quickly a folio of copy to leave nonchantly in the roller?” That would have been Sue Merry, the continuity girl. The first scene was probably the one in which Uncle Jim is typing with the green parrot on his shoulder when a firework goes off on his cabin roof. 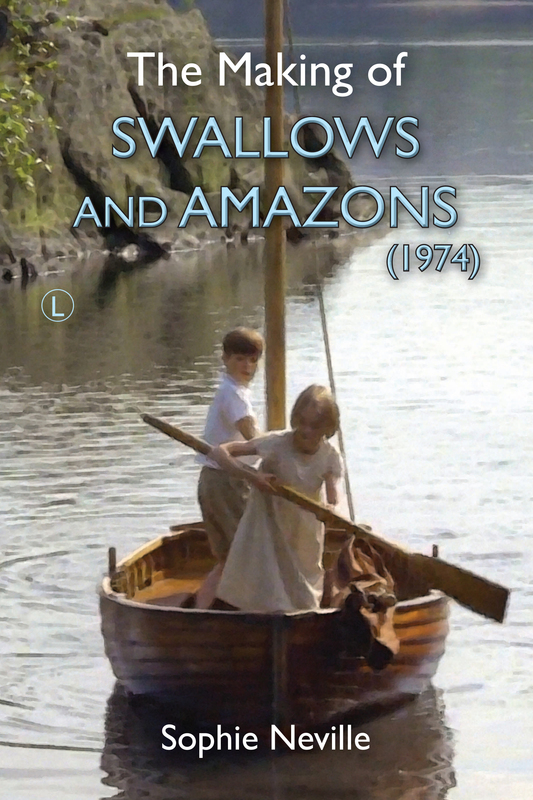 I wonder if Arthur Ransome had ever been disturbed by the Altounyan children in such a way. Did he use an Imperial typewriter? The film crew were on location on Derwentwater. “By now, the houseboat has been moved and moored to the western shore just off a promontory that is being faked up as one end of Wild Cat Island.” The houseboat, really one of the stars of the movie, was being played by a long-time resident of Cumbria, The Lady Derwentwater. A 56 foot motor launch, owned by the Keswick Launch Company since 1935, she returned to real life after the filming, rather like I did. She still carries up to 90 passengers. You can go out on her today. My father, who is keen on steamboats, had been off to find the real houseboat that Arthur Ransome had in mind. Am I right in thinking this must have been the original Gondola? I expect she was too un-seaworthy for the production team to contemplate using in 1973. A reliable, water-tight boat that could be towed into the location used for Houseboat Bay was needed. Last year we went to see TSSY Esperance at the Windermere Steamboat Museum in Cumbria, which is another Victorian steam yacht invisaged by Ransome as a possible model for Captain Flint’s houseboat. It is a beauty but we did get a better view of the lake from of the cabin windows in the Lady Derwentwater. “The rain has stopped, the mist is lifting from the 1,500 foot ridge of Cat Bells. Fraser climbs gingerly aboard, awkward in co-respondent’s brown and white shoes, rosy make-up and moves into the aft cabin.” McNay continues. He is describing the main scene to be shot that day. “John, alias Simon West, is in a rowing boat 15 feet away… The problem this time is that the rowing boat has to remain anchored but look as though Simon is pulling steadily in towards the houseboat and the anchor rope has to remain hidden.” This must have been so that Swallow could be lined up acurately and remain in focus for the camera. It is one of the secrets of making the film that I have been asked about directly. “Simon shows Claude Whatham how he’ll manage it. Quick rehearsal inside the cabin. Ronald Fraser on his knees by the chest folding a white pullover, catches sight of approaching boat, mimes angry surprise. Told not to jerk head so far back. Instead jerks eyebrows up. The cabin is no more than eight foot by ten and contains besides Fraser and the props, four men on a camera, one on lights, and the continuity girl.” McNay had not included Claude the director, who I know would have squeezed in since these were the days before monitors from the camera feed. And he was small. The sound recordist was bigger but may have just planted a microphone on the desk. “On the small aft deck Pilbrow is for the next few minutes going to be redundant.” This is Richard Pilbrow, who now lives in Conneticut and I am sure will read this post. “He is a mild, inoffensive looking man producing his first film. He is 40… looks like your friendly local antiques dealer. He and Whatham are a good team: Whatham is slight, energetic and calm. He has time, even as a sequence is being set up, to ask the Press if they can see enough of what’s going on from the crampt aft deck of the housebaot. It’s a cheerful crew, (Denis Lewiston the DOP) watching clouds overhead with benign suspicion, taking light meter readings inside and out-side the cabin every 30 seconds. ‘Action,’ said quietly into the cabin. ‘ACTION,’ across the lake to Simon. The clapperboard shows 461 take 1. Fraser folds the pullover, looks up, jerks eyebrows in angry surprise, camera swings round to follow Fraser’s gaze through the window, Simon pulls on left oar, keeps the rope hidden. The Gondola on Coniston Water today, re-built and restored by the National Trust, powered by steam and taking passengers down the lake from April to November. I always abandon my proper work and instantly click on the latest from the film front. This is all meat and drink to us, Sophie. Thank you. These posts always take a while to put together but I am spurred on by your encouraging comments. Re: the original houseboat. Ransome definitely used a picture of the Gondola to show one of his illustrators, but there’s also a suggestion that the original was the Esperence – which is at the Windermere Steamboat Museum. It was used as a houseboat on Windermere in the 20s/30s – but it has a similar “look” to the Gondola. Terry Smith was my dad, who passed away recently on the 22nd september following a long struggle with cancer. i was just wondering if there was any more photographs or footage of him and the others in the crew at all?? any information who be much appreciated as i am archiving my dad’s life.